“We have a trade to announce.” Those six words have to rank among hockey fans’ favorite phrases. And ironically, that’s especially true when they’re spoken by one of the sport’s most unpopular figures: NHL commissioner Gary Bettman. Those six words have to rank among hockey fans’ favorite phrases. And ironically, that’s especially true when they’re spoken by one of the sport’s most unpopular figures: NHL commissioner Gary Bettman. That’s because “We have a trade to announce” has become Bettman’s go-to catchphrase when a deal is struck during the NHL draft; they’re the words he uses to inform fans that they’re going to want to stop booing him long enough for him to break down the details. Sometimes the deal that follows is a blockbuster; sometimes it’s just a boring flip of draft picks. But you never know until Bettman lays out the details, piece by piece, into a live microphone in front of a few thousand fans. 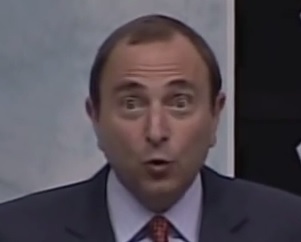 And make no mistake, Bettman seems to relish the moment. This is a guy, after all, who spends pretty much all of his time getting pelted with hockey-fan venom. Whether he’s introducing the draft or giving a press conference or handing out the Stanley Cup, he’s basically on the receiving end of a nonstop barrage of negativity. Why wouldn’t he savor the one opportunity to soak in some good vibes? This year will mark Bettman’s 22nd draft as NHL commissioner, and with trade speculation hitting overdrive in the days leading up to the first round, there’s an excellent chance we’ll get to hear him announce a deal or two Friday night. Let’s hope so, because Bettman’s trade announcements double as a teachable moment for hockey fans and, indeed, for human beings everywhere. So in anticipation of that moment, let’s look back through history at the life lessons we could all learn from Bettman’s announcements of different kinds of trades over the years. The trade: At the 2012 draft, the Penguins sent Jordan Staal to the Hurricanes for Brandon Sutter, prospect Brian Dumoulin, and a first-round pick. This was a major deal that had been rumored for days, and as an added bonus that year’s draft was being held in Pittsburgh. • The “We have a trade to announce” intro, followed by the requisite excited crowd reaction. • The pauses between names that are just long enough to let the crowd react, but not so long that the whole thing feels overly dramatic. • At least one awkward moment. In this case, it comes after Bettman announces the first-round pick and Sutter, then drops an exaggerated “AND” like he’s a parent reading Fox in Socks to a toddler. This whips the crowd into a frenzy, at which point Bettman reads off the name of a prospect that none of them have ever heard of. • The immediate repeating of the details, which nobody ever listens to. I’d love to see him change the names on us some time, just to see what would happen. • All the classic Bettman mannerisms you’ve come to know and love: the head shake, the eyebrow flexes, the random finger points. Seriously, this whole sequence was pretty much perfection. He knocked it out of the park. The life lesson: There’s no substitute for experience. Once you close in on 20 years of doing something, you should expect to be pretty darn good at it. The trade: At the 2006 draft, the Kings traded Pavol Demitra to the Wild for Patrick O’Sullivan and a first-round pick. Not exactly a blockbuster, but not bad either. The late Demitra was a three-time All-Star and consistent 60-point guy, while O’Sullivan was considered a decent prospect. The announcement: This one’s pretty basic. Two players, one pick. Nothing complicated, and the draft is in Vancouver so there’s no hometown crowd reaction to plan for. Bettman has got more than a decade under his belt by this point, so you’d figure he’d ace this one without breaking a sweat. This kills me. He kind of saves the moment with a little laugh, but you can tell he’s flustered because his pointer finger immediately goes nuts. The life lesson: Always be sure to anticipate the impact your words will have on others. The trade: This remains the most common type of draft-floor trade, and they rarely turn out to be especially memorable. In this one, from the 2009 draft in Montreal, the Islanders and Blue Jackets swap a bunch of picks. The announcement: If you subscribe to a particular strain of anti-Bettman thinking in which he’s more of a number cruncher than an actual hockey guy, then you’d expect this kind of deal to be right up his alley. After all, there’s none of those annoying hockey players involved — just a bunch of digits. And, as expected, Bettman starts off strong here. But the picks just keep coming, and he seems to lose focus toward the end. He starts making a “Wait, another one?” face, as if he can’t believe these two largely irrelevant teams have bothered making a deal this complicated. Honestly, if you were an NHL GM making a draft-floor trade, wouldn’t you get the other team to tack on a bunch of meaningless sixth- and seventh-round picks from future drafts just to make Bettman stand up there for a half-hour? The life lesson: Always know how big a task lies ahead of you before getting started. The trade: In what may rank as the biggest draft-floor deal of all time, Quebec sent Mats Sundin, Garth Butcher, Todd Warriner, and its first-round pick to the Maple Leafs for Wendel Clark, Sylvain Lefebvre, Landon Wilson, and their first-rounder. This was a huge deal at the time — it was the first trade in sports history that featured two former first overall picks being swapped for each other — and Sundin’s 14-year, Hall of Fame tenure in Toronto makes it even bigger in hindsight. And it happened in the pre-Internet days of 1994, meaning it was completely unexpected. Nobody thought the Leafs would ever trade Wendel, their captain and heart and soul for almost a decade. Seeing it play out on live television was kind of nuts. But what this one lacks in style, it more than makes up for in crowd response. The fans in Hartford are already buzzing when Bettman steps to the lectern, and they get increasingly vocal as he starts reading names even though he makes the rookie mistake of rushing through them. The inclusion of Sundin, a 23-year-old center just one year removed from a 114-point season, draws a confused murmur. But it’s the announcement that the Leafs have traded Clark that gets the big “OOOHHH,” which they then repeat, even louder, once the entire deal has been read. The Hartford fans basically react to this deal like a wrestling crowd that’s just seen somebody power-bombed through a table. Which, if you knew any Leafs fans in the immediate aftermath of this deal being announced, you’d realize they basically had. The life lesson: Always be sensitive when breaking news that’s going to ruin somebody’s life. Bonus life lesson: We all looked ridiculous in 1994, and all footage of that era should be destroyed. The trade: At last year’s draft, the Devils traded the ninth overall pick to the Canucks for goaltender Cory Schneider. This was a shocker, coming after a full year of the Canucks trying and failing to trade Roberto Luongo instead. In one move, two teams signaled massive shifts in their goaltending philosophies — the Canucks back to Luongo (temporarily, as it turned out), and the Devils away from Martin Brodeur’s two-decade reign as the undisputed full-time starter. It was a stunner. Oh, and did we mention that the draft was taking place in New Jersey? That sort of reception continued for years, up to and including the 2013 draft, which created an interesting dynamic as Bettman approached the lectern to announce the Schneider deal. Would Devils fans let him get a word in? Could the power of “We have a trade to announce” prevail, even in enemy territory? And … it works! He shuts them up! As much as they detest him, Devils fans’ collective curiosity wins out and they quiet down for his announcement. Bettman reveals the trade, then basically drops the mic — he doesn’t even do the traditional “repeat all the details” bit. And the crowd is too shocked to even boo him off the stage. I love everything about this. Go ahead and hate the man if you must. But on this day, for one moment, Gary Bettman won. The life lesson: Screw the haters, man.